Redecorating a room with new wall décor is feasibly one of the surest ways for customers to change the overall look and feel of the space with minimum impact on the bank accounts. With the revamp in housing sector in US as well as in Europe, the home décor market has started to grow, simultaneously impacting the wall décor market. The offices, homes, clubs have been inclined towards creative interior designing. In 2016 interior design market has reached USD 94.0 billion globally. Goldstein Research analyst forecast the global wall décor market size is set to reach USD 23.2 billion by 2024, growing at a CAGR of 9.0% over the forecast years. The rising demand of the wall décor products is dependent upon the construction of new property or renovation of the existing property along with the spending capacity of the consumer. 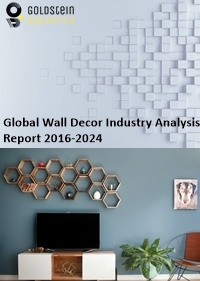 Covered in This "Wall Décor Market Report"
The report covers the present ground scenario and the future growth prospects of the wall décor market for 2016-2024 along with the import and export data of the wall décor products. We calculated the market size and revenue share on the basis of revenue generated from major players and sales of wall décor from major players across the globe. The property construction statistics, personal disposable income and the number of consumers buying selected wall décor products as well as customers buying wall décor products in bulk by the interior designer statistics is also contained within the report. On the basis of product type, wall art and paintings segment has largest market share of 27.1% of the total wall décor market owing to better enhancing of the wall and the space, either through hanging the paintings or by directly painting on the walls. It is also the outlay of the hobby of the collecting paintings. Wall paper segment is the fastest growing segment at the rate of 7.3% owing to the enhanced visual appearance by various designs and colors on the walls that eliminates the need of paints. Wall décor market outlook 2016-2024, has been prepared based on an in-depth market analysis from industry experts. The report covers the competitive landscape and current position of major players in the wall décor market. The report also includes porter’s five force model, SWOT analysis, company profiling, business strategies of market players and their business models. Global wall décor market report also recognizes value chain analysis to understand the cost differentiation to provide competitive advantage to the existing and new entry players. There is a rising trend of using waste materials such as broken pieces of utensils, cutlery, bottles, caps, ropes and many more things in an appealing way, which are cost effective and customizable as per the requirement and are cost effective as compared to costly wall décor products available. According to the report, the growth in the retail sector is the key factor driving the wall décor market. Post construction of a residential property or a business property, it requires decoration including the wall décor. Printed graphics can be professionally installed quickly with no messy paste, paint odor or dry time for less business downtime. Further, the major challenge for the wall décor market is the growing trend of DIY wall décor that uses waste materials and other cost effective things for decorating walls. Customers are endowed with the creative and cheaper products which can be changed again and again without spending much on the decoration. Based on geography, North America is leading the wall décor market with share of 23.4% of the global total, owing to the customer lifestyles, preferences, and tastes which has been changing as per the consumer income levels. Asia-Pacific is the fastest growing market at the rate of 6.3% owing to the rapid residential and commercial construction that will require the interior decoration also the rising income of the people have started renovating their places. What is the revenue of wall décor market in 2015-16 and what would be the expected demand over the forecasted period?